This savory spin on a classic American side dish turns boring Mac and Cheese into a main dish to be reckoned with. Bacon? Did someone say bacon? Bacon. It’s one of the greatest things known to man. Or at least to the people in my house it is. Bacon makes everything better. 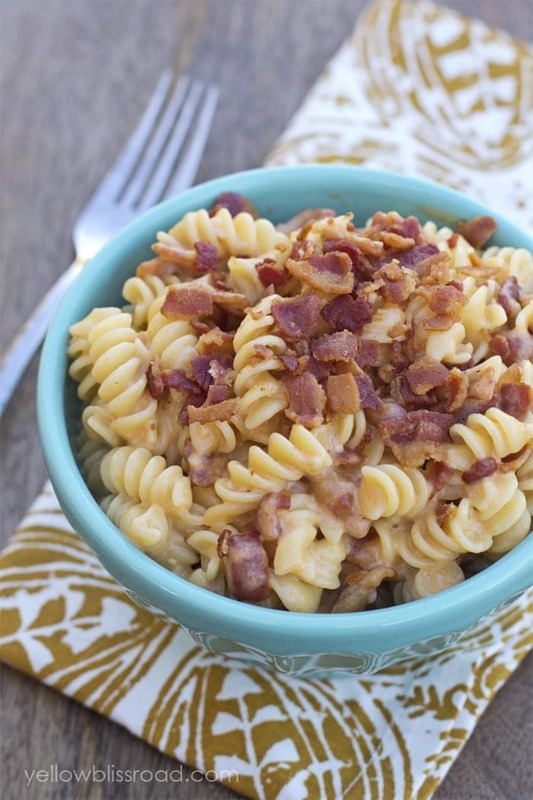 This mac and cheese is so easy to make. For the most part one pan is all you need. The pasta cooks in some nicely salted water, then the water is drained with some reserved for making the sauce (bet ya didn’t see that coming). The starchiness from the pasta water helps to thicken the sauce, and a little touch of cream cheese adds a great creamy texture. 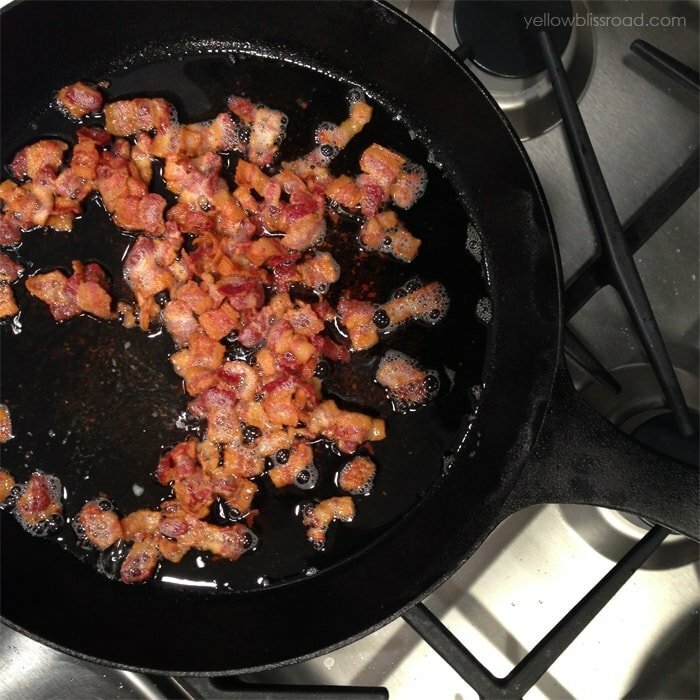 While the pasta was cooking, I cooked up some bacon that I’d diced up. Don’t you wish you had smell-o-vision? 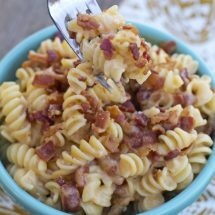 So you’ve got the pasta and some reserved pasta water, then you add some sharp cheddar cheese, a couple ounces of cream cheese, garlic and of course, bacon. It’s seasoned with a little salt, pepper and dry mustard. The whole thing took me maybe 15 minutes from start to finish. It’s incredibly creamy and rich. Even the leftovers were delicious – just add a couple tablespoons of milk per serving of leftovers and and microwave for a minute to a minute and a half. It was still amazing! P.S. Did you know that today is National Noodle Day? What, you didn’t know that was a thing?? Well it’s totally a thing and it really should be a big deal because pasta is awesome. IF you’re planning on celebrating tonight, here are 11 more seriously awesome and delicious pasta and noodle recipes (did you know there’s a difference between the two??). Heat a pot of water to boiling, add a good amount of salt, and the dry Rotini. Cook uncovered over medium heat until al dente, about seven minutes. While the pasta is cooking, slice bacon into half inch slices. Cook, drain on a paper towel, and set aside. Once pasta is finished cooking, drain the water from the pan, reserving at least a cup or so. Return pasta to the pan and stir in half a cup of the reserved pasta water, cream cheese, garlic and seasonings until blended. Add the cheddar cheese and stir until completely melted. If sauce is too thick, add more pasta water. Divide into bowls and serve as a main dish, or plate as a side dish. For all main dish recipes on the site, be sure to go HERE. 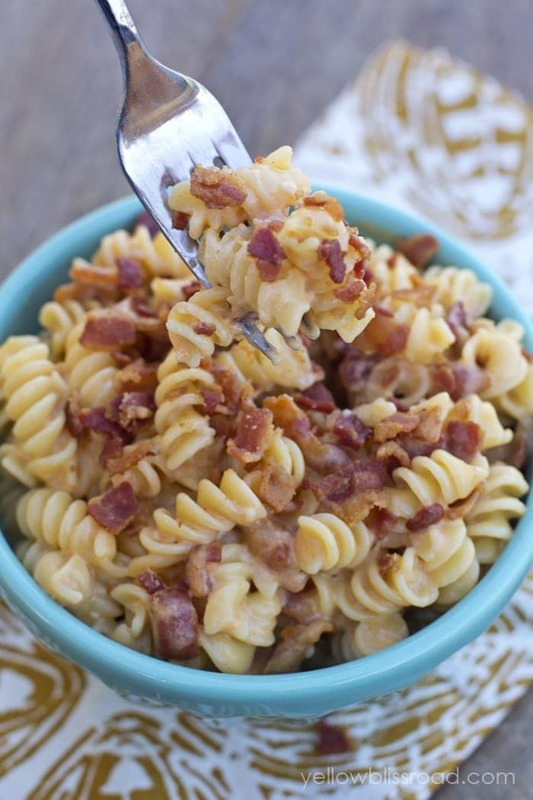 LOVE bacon + mac and cheese. So good! 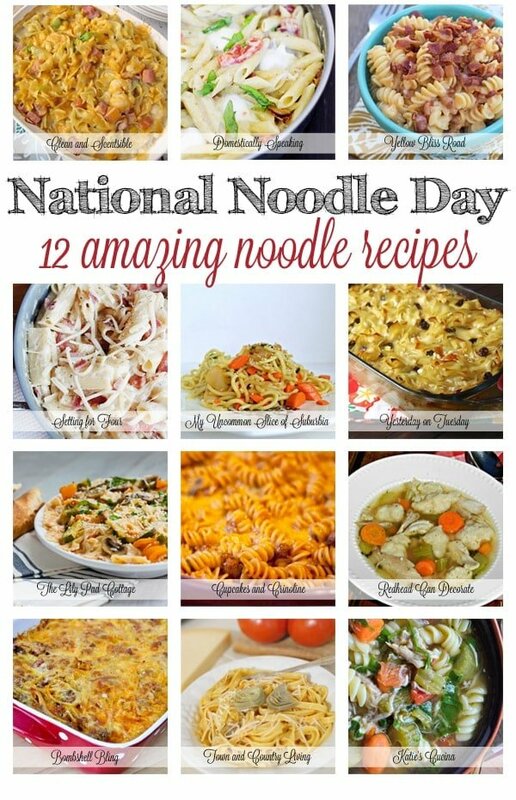 Thanks for organizing national noodle day! Anything with bacon that can be cooked in under 30 minutes is a BIG win in my book!!! love this . . looks so good, pinned!! All is right in the world when I’m eating bacon and cheese lol! Looks amazing and filling! My boys will luv this! 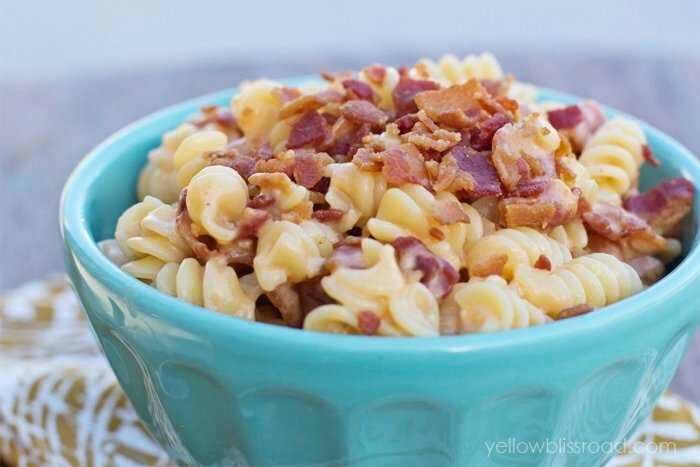 This looks amazing… and a Mac and Cheese upgrade would be welcome around here! Pinned. Looks good, Kristin! I would have to make it without the bacon since I don’t eat meat. 🙂 Hubby would like it with the bacon though. OH does this look good, my kids would gobble this one up!!! YUM!!! Anything with bacon is a must try. Pinned!